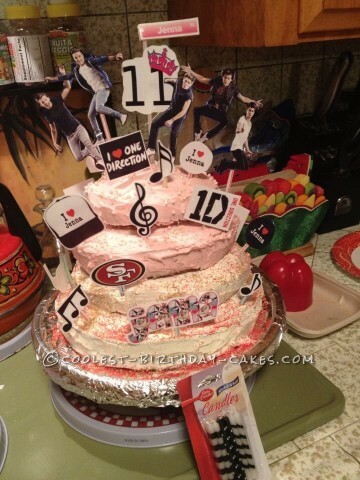 My “One Direction 49er-licious cake for tomorrow’s Super Niner Ballz Bowl with my Zumba familia and Jenna’s 11th Birthday!! This is a 4 layer – Cherry Chip (red flick inside) cake. 2 cake boxes purchased from grocery store. Betty Crocker. Frosting is 2 layers of butter cream and 2 layers of strawberry mist and lots of gold and red sprinkles and white and pink candy pearls and loaded with gobs of love (the secret ingredient). I always insert a drinking straw- cut to the height and size of my cake and insert down the middle to secure the cake and make it safe. This way it wont slide or slip. I always build my cakes on a Lazy Susan for easy turning, decorating and viewing at the party. I print images I find online from Googling my friend’s favorite band One Direction, our favorite football team that was playing in the Super Bowl 49ers logo, and music notes, symbols and simply glued them to toothpicks and straws and insert into cake. Add sprinkles and Presto! I recomend adding sprinkles right after you frost since the frosting hardens up and they wont stick as well if you do later. Enjoy!